Narendra Modi’s state visit to Russia could result in a bevy of important defense deals. Indian Prime Minister Narendra Modi arrived in Russia on Wednesday, where he will spend two days meeting with senior Russian officials, including Russian President Vladimir Putin. The visit will cover the gamut of the India-Russia bilateral relationship, touching on economic, defense, energy, and counter-terrorism. Notably, Modi is expected to confirm India’s sale of Russia’s advanced S-400 Triumf missile defense system. India will become the second buyer of the advanced platform after China. The visit marks Modi’s first state visit to Russia since becoming India’s prime minister in May 2014. Modi previously traveled to Russia for the Shanghai Cooperation Organization and BRICS Summits over the summer in Ufa. Last year, Putin traveled to India for a bilateral visit, signing billions in agreements on trade and nuclear cooperation. The S-400 deal with Russia is significant in many ways. It will represent the largest Indian weapons deal with Russia since 2001, restoring Moscow’s position as India’s top arms provider—a position it had held since the days of the Soviet Union but has recently conceded to the United States. Additionally, as I noted in an earlier piece for The Diplomat, the S-400 is an eminently capable missile defense system, among the best in its class in the world. Adding the S-400 to India’s arsenal will bolster India’s ability to protect against ballistic missiles and bombers from hostile neighbors. For Russia, India’s continued appetite for defense hardware is a welcome opportunity at a time when western sanctions and drooping oil prices have hurt the country’s economy. The Russians no doubt took note when, last year, during Putin’s state visit to New Delhi, Narendra Modi noted that “Russia will remain [India’s] most important defense partner.” Echoing last year’s assurances, Modi assured Putin that Moscow would remain India’s “principal partner” in defense, Russian state news reported. “Russia has been India’s foremost defence partner through decades, accounting for a majority of our defence equipment… Even in the current environment, despite India’s improved access to the world market, Russia remains our principal partner,” Modi told Itar-Tass. Though the S-400 is the highlight deal, other defense-related agreements may be on the bilateral docket during this state visit as well. In what could be a boon for India’s domestic defense industry, Russia’s Kamov OAO could tap an Indian firm to build 200 Ka-226T light choppers. Also, as Franz-Stefan Gady noted earlier, India is interested in leasing a second Akula II-class Russian nuclear submarine. On top of these agreements, there could be new momentum on the resumption of joint development on the T-50 PAK FA fifth-generation fighter. Modi and Putin may also agree to jointly manufacture Russian Grigorovich-class frigates in India—India wants the frigates, which are similar to the Talway-class frigates it already operates, but wants to build them in India. Beyond defense, Modi is expected to leave Moscow with new agreements on nuclear energy and trade. Modi will reiterate India’s commitment to building 12 nuclear power plants with Russian technical assistance. “Nuclear energy is an important component of our energy security strategy. Russia is currently our leading international partner,” Modi said, speaking in Moscow. On trade, Modi remarked that Indo-Russian commerce had not “achieved its full potential.” India and Russia are targeting a bilateral trade volume of $30 billion by 2025, and a mutual direct investment target of $15 billion by 2025—the latter commitment came out of the recent India-Russia Inter-Governmental Consultations in October. 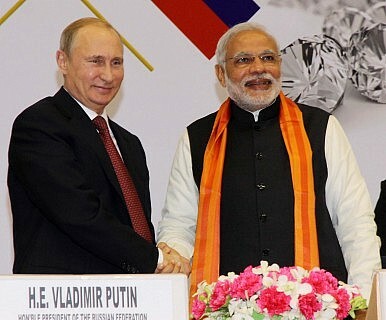 Beyond bilateral issues, Modi and Putin are likely to discuss broader international issues, including the fate of Afghanistan, where both India and Russia have important interests, the ongoing crises in the Middle East, and the future of regional and international institutions where both India and Russia participate, including the BRICS and the Shanghai Cooperation Organization. The relationship between New Delhi and Moscow will see simmering challenges come to a head soon.